Dr. Karen Kim has offered SculpSure® body contouring, weight loss management, preventive medicine, women's health medicine, and ear piercings to residents of Downtown and Koreatown Los Angeles, California and the surrounding areas for more than ten years. Dr. Kim has developed a keen understanding of her patients’ most common health concerns and believes in taking a team approach towards healthcare, with her patients being the most important team members. As a board-certified internist and cosmetic specialist, Dr. Kim has dedicated her practice to building a link between external beauty and internal medicine. She provides real solutions to patients with complex medical problems who also desire to improve their appearance. 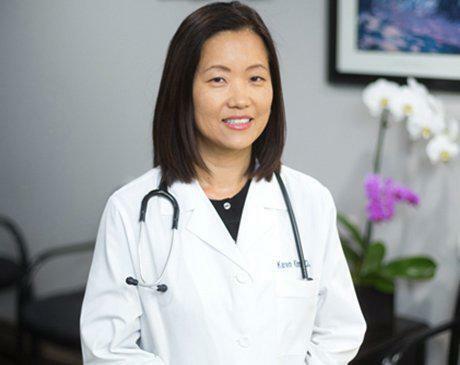 Dr. Kim has also built relationships with a vast network of specialists in the Los Angeles area and is affiliated with the Good Samaritan Hospital, which allows her to act as a referring primary care physician in addition to her specialty areas. Dr. Kim enjoys exploring Southern California with her husband and two daughters when she isn’t tending to the health concerns of her patients. "Dr. Kim is smart, thorough and caring. She has been my MD for about 5 years." "I've recommended many friends to Dr. Kim and all have been impressed." "Medically speaking, she is the best doctor I have ever had." "She knows what she is talking about. I would definitely recommend her to others." "Very nice staff. Dr. Kim was very prompt and professional. Easy to talk to." "Took the time to really get to know why I was there. Would highly recommend her." "She is very easy to talk to and has shown me genuine concern as a caregiver." "She truly and deeply cares for her patients, down to a very personal level." "Dr. Kim was very professional." At Dr. Kim's office, we accept most major insurance plans. Here is a short-list of just some of the most popular plans we accept. Please contact our office if you do not see your insurance provider listed here.